The weather finally seems to have calmed down (this westcoast girl has been sweltering in the humidity – bring on the rain! ), the leaves are turning, and the smell of pumpkin spice lattes fills the air. 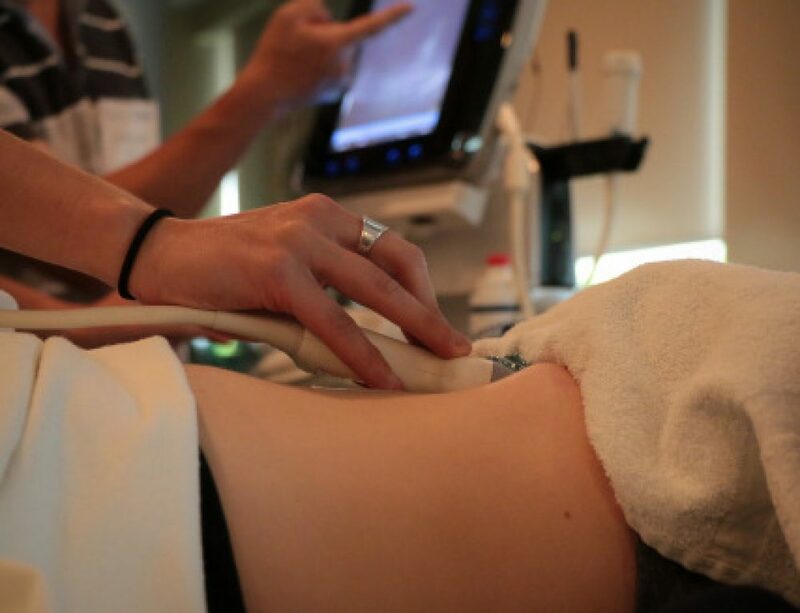 It’s officially fall – a whole new season of POCUS goodness. This is a 69-year old male post-PEA arrest admitted with severe pancreatitis and ARDS. He very sick, on substantial doses of three vasopressors. Oxygenation/ventilation has also been a challenge, and he’s consequently on high levels of PEEP. The fellow comes over, scalpel in hand – does this guy need a chest tube? This 67-year old lady is admitted to the unit with a GI bleed and suspected sepsis. Without giving too much away, I’ll say that she has a significant cardiac PMHx that was concerning for being a major cause of her shock. Based on these images, what can you say about the etiology of her ongoing shock? 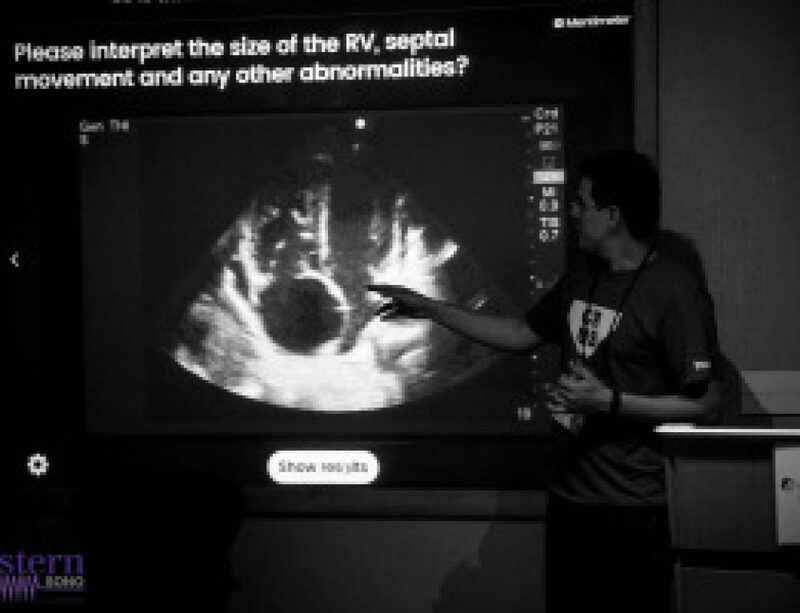 Sometimes you don’t necessarily want to learn; you just want to look at beautiful POCUS pictures. Introducing our new Eye (s)Candy (get it?) feature – for those clips that are just too pretty not to stare at. If anyone needs me this week, I’ll be sitting here hypnotized by the intoxicating bubbles in this right atrium – shown beautifully on a TEE bubble study. 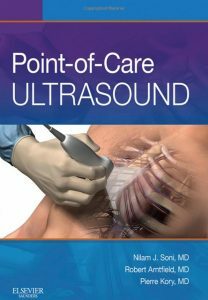 For the ultrasound terminology nerds, this one’s a real winner. We have no less than THREE specific “signs” identifiable in this particular clip. Most of you will have correctly identified a large pleural effusion (the anechoic space), seen above the liver and diaphragm (screen right). There is collapsed atelectatic lung flapping around inside the effusion – termed the Jellyfish sign (1). We also see spine inferior to the effusion, which is not normally visible in the thorax through aerated lung – the Spine sign (2). Finally, the astute among you will have picked up the swirling debris in the inferior aspect of the effusion. 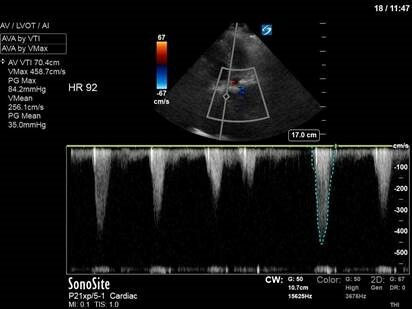 You’ll note how the effusion goes from completely anechoic more anteriorly, and then gradually becomes more isoechoic in a ombre-like manner (the effusion is very on-trend). This is seen in hemorrhagic effusions due to gravitational layering of cellular and liquid components of blood, the same way blood will separate in a test tube if left long enough. It’s termed the Hematocrit sign (3), and is very useful when seen to identify blood within a space. In this patient’s case, she had a hemorrhagic pleural effusion secondary to her metastatic malignancy. A chest tube was placed for drainage and she experienced symptomatic relief. This is a very interesting case where spectral Doppler beautifully illustrates dynamic physiology changes that otherwise may have gone unnoticed. POCUS for the major win. In the initial A4C clip, you can appreciate that the heart appears hyperdynamic, with the LV walls seeming to touch in systole. Putting PW though the LVOT to get our VTI revealed aliasing, meaning that the velocities in that location exceed our Nyquist limit and can’t be processed. Our next image uses spectral doppler in the same location, but CW instead of PW. This time we are able to measure the maximal velocity and pressure gradient (remember, CW has no Nyquist limit), which reveals a maximum pressure gradient of 45, and a mean pressure gradient of 21. VTI measured here would be 61 – CRAZY high. So what’s causing these sky-high numbers? 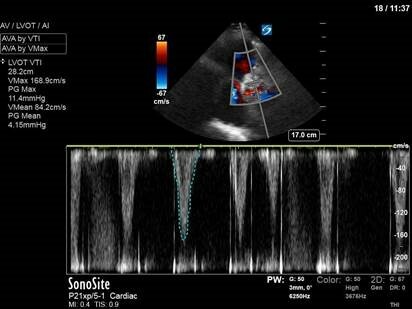 Something has caused blood flow to speed up – significantly – though the LVOT. Very high LVOT VTI readings should always make you suspicious for some sort of intra-cavitary gradient or obstruction. In her case, a significant pressure gradient is obviously present. 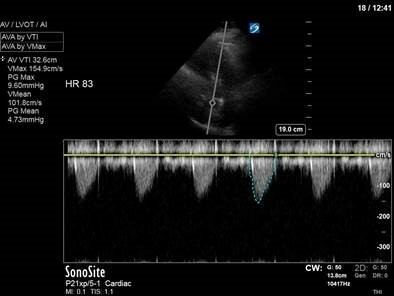 With a very keen eye (and a clip played at 1/4 speed), you can actually appreciate the anterior leaflet of the mitral valve being pulled towards the septum in systole – aka SAM (systolic anterior motion of the mitral valve), most commonly seen in HOCM, and associated with LVOT obstruction. 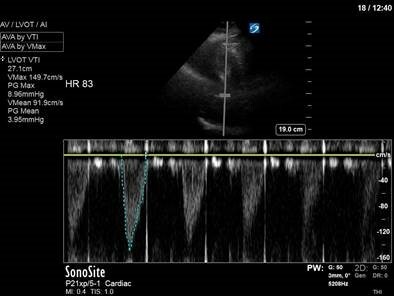 In our patient’s case, there was no history of hypertrophic cardiomyopathy, and she had a fairly normal pre-op echo. However, the combination of an underfilled LV (secondary to hemorrhagic shock and incomplete resuscitation) and hyperdynamic contractility (with the addition of the dobutamine) led to transient LVOT obstruction. Often these patients will have underlying substrate that predisposes them to transient LVOT obstruction, such as LVH or a sigmoid septum; though none seem to be obviously present in our patient (septum is just slightly sigmoid-shaped). See the attached paper for a discussion of dynamic LVOT obstruction in the setting of catecholamine use. It’s not frequently diagnosed, but is something that should be considered in all patients who worsen with initiation of inotropic therapy.